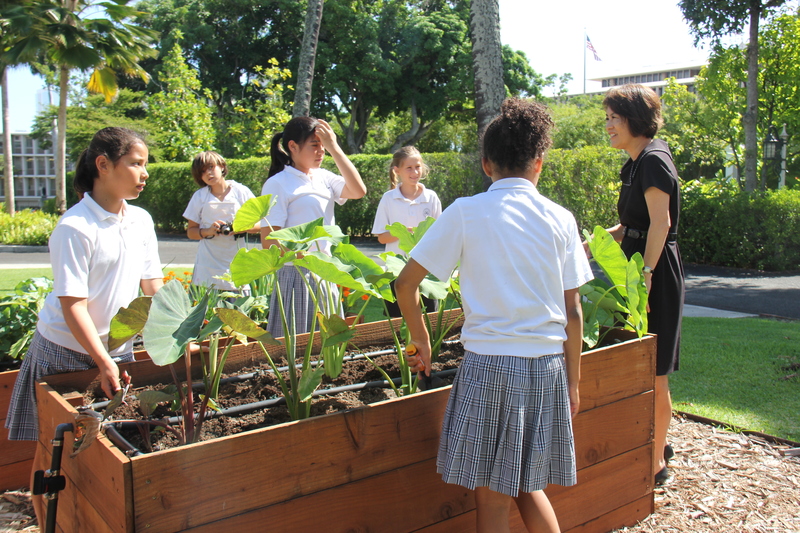 First Lady Dawn Amano-Ige in the garden with St. Andrew’s Priory students. The Washington Place garden has been transformed into a model of sustainability and hands-on education, thanks to an initiative by first lady Dawn Amano-Ige and the “grow local” enthusiasm of many. The result is eight new, organically managed vegetable beds bursting with kale, kalo, eggplant, beets, carrots and tomatoes and an aquaponics system for efficient use of water. The Washington Place garden partnership includes the state Department of Agriculture and the UH College of Tropical Agriculture and Human Resources (CTAHR) with 6th grade students from St. Andrew’s Priory coming every Wednesday to tend to the vegetables. “We even have seeds from the White House garden,” Mrs. Ige said.